The Delaware Contemporary announces a new joint venture with the City of Wilmington as we present three art exhibitions on display in the lobby of the Louis L. Redding City/County Building that will be curated by The Delaware Contemporary. These exhibitions will join the monthly Art Loop Wilmington as part of the city's newly unveiled campaign, It's Time, a dynamic blueprint for renewal that celebrates ingenuity from the region. The Redding Gallery will serve as another source to showcase the best of Wilmington, demonstrate pride in the talent of its residents, and highlight the stories and artistry in a welcoming, diverse context. Mayor Mike Purzycki and Joseph J. Gonzales, PhD have worked to connect these two entities with the intention of drawing local and regional art enthusiasts to the Downtown District offering an opportunity to engage with featured artists and their work. The inaugural self-guided exhibition features the large-scale, mythological paintings by Philadelphia-based artist Timmy Graham. Graham takes fourth dimensionalism on a color journey as he fuses math and science with art in his massive oil paintings. Inspired by the theory of relativity, color relates to measured distances on the electromagnetic spectrum as every brushstroke becomes an individual plane. "All colors in a spectrum when encountered by light produce their own wavelength... Therefore all colors are spatial elements and distinct in their own right." While fourth dimensional art has its roots in the mid-1700s, Graham's experimentation ushered a new approach to his art making process. Viewers are invited to visualize the paint's height, width, length, and depth as it steps off the canvas and extends into another dimension in space. At first glance one sees geometric patterns and symbols. After close inspection one finds figures, gods and goddesses, some dancing with snakes or dagger-wielding archetypes. Graham includes symbols of dominance and oppression. Sexual and spiritual foundations release a higher state of being and social commentary. Timmy Graham received a certificate of Fine Arts at the Pennsylvania Academy of the Fine Arts in Philadelphia, PA, followed by a Bachelor of Fine Arts from the University of the Arts in Philadelphia, PA. A Fulbright Scholar and Pollock-Krasner recipient, Graham has received awards and fellowships for his work. In 2009, he was awarded full fellowships at The National Art Studio and the CAMAC Centre D'Art in France, along with the Foundation Tenot Individual Artist Grant in Paris. In 2010, he was named Artist in Residence at South Africa's University of Witwatersrand. 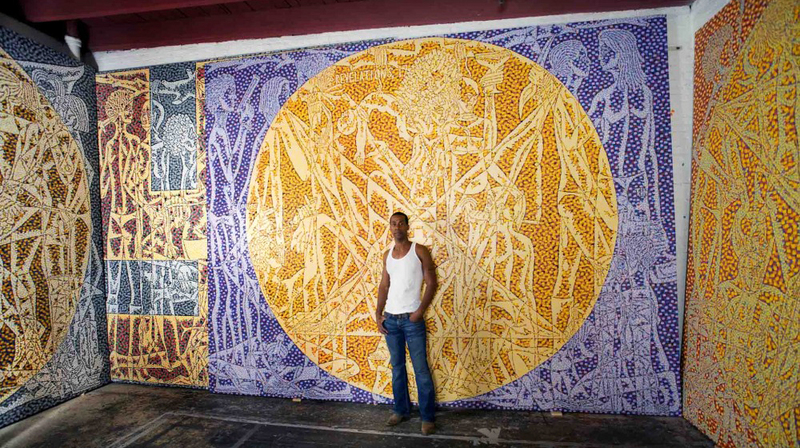 He received both an award from the Mid-Atlantic Arts Foundation and an Individual Artist Fellowship from New Jersey State Council on the Arts. His work has been featured in several arts publications around the world such as Art Buzz and New American Painting.